Here's an offer not to be missed, WeChat has announced their latest addition of Official Accounts in Malaysia to be none other than Secret Recipe Malaysia. In conjunction with Secret Recipe's 16 anniversary, and together with WeChat, all WeChat users get who purchases one slice of cake while dining in are entitled to one free slice of cake, terms and condition applies. Just last night, bloggers were invited for a bloggers' night out with WeChat and Secret Recipe over at their outlet in Oasis Square Ara Damansara. I had the opportunity to attend and learn more about the offer and collaboration. It's a pretty sweet deal I must say. Reaching the venue just in time to catch up with fellow bloggers before munching on some finger food prepared for us. I was pretty please to see some familiar faces among the crowd, as we anticipated the speech. Check out some pictures I managed to capture of the event below. 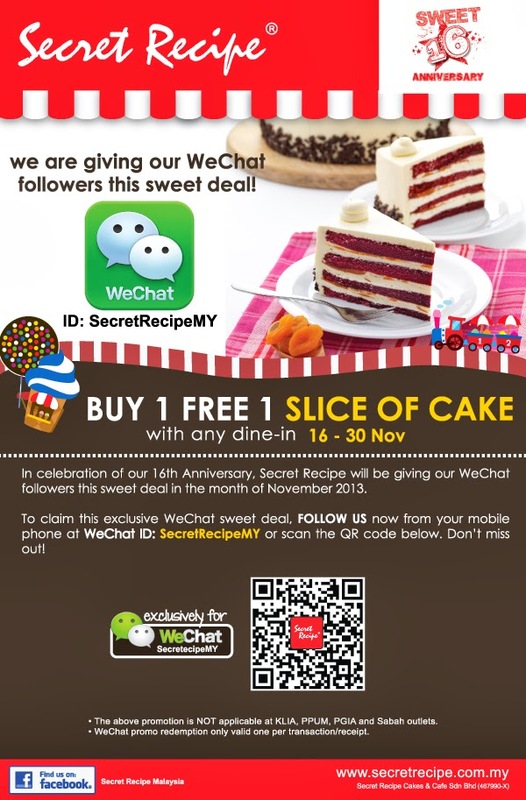 Secret Recipe in collaboration with WeChat Malaysia will be offering Buy 1 Free 1 Slice Of Cake with any dine-in from 16th to 30th November 2013 too! Now you can enjoy two slice of your favourite cake for the price of one, marble cheese cake would be my preference. Just remember to follow SecretRecipeMY on WeChat for this sweet deal. Just had to snap this nice "finger food" last night, love satay to bits. Hope to drop by today...if it's not too crowded since it's 1 slice, 1 free. Saw so many that went to this event.